Tim Wardle’s feature debut is an emotional rollercoaster of a documentary, and a stark illustration of the tragic consequences of unethical research. 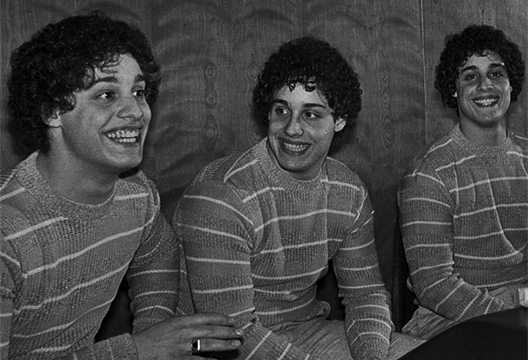 USA, 1980: identical triplets aged 19 and separated at birth, miraculously find one another. It is the stuff of popular fiction, and the trio swiftly become media stars and regulars on the New York party scene. However, the notable absence of one brother in the present day interviews becomes increasingly ominous as the triplet’s’ story unfolds. The answers given by the New York adoption about why they were separated also appear hopelessly inadequate. Enter Pulitzer prize-winning writer Lawrence Wright, who, in 1995, came across an obscure twin study from the 50s and 60s run by psychoanalyst Dr Peter Neubauer. Since the first twin studies of Merriman and Theis published back in 1924, the contribution of twin research to the nature/nurture debate has been unquestionable, if inconclusive. One criticism has been insufficient difference in environment of adoptive twins, due to the standard adoption policy of placing children in culturally and economically similar homes, and which is understood to have skewed results towards genetic effects. In what appears an attempt to address this limitation, Neubauer, in collaboration with a willingly corrupt (and now defunct) New York adoption agency, contrived a longitudinal study by placing these same triplets in three families of different socio-economic status and monitoring the results. Thus the film shifts from ecstatic reunion, to the stuff of sinister scientific nightmares and family tragedy. As the brothers recall their vague childhood memories of regular home visits by mysterious researchers who took them through various tests, the trauma is evident. Incredibly, the filmmakers persuaded both a former researcher and research assistant of Neubauer to go on camera; their testimony provides uncomfortable reminders of how psychological ethics fifty years ago were not the consideration they are today. Nonetheless, it is hard not to feel anger towards them, and those implicated in wider suspected corruption. Powerful bodies are accused of having thwarted the families’ attempts to seek justice regarding both access to the surreptitious studies in which they were involved, and the original outrage of the brothers’ separation in early childhood. The film ultimately reveals the tragic futility of Neubauer’s destructive research: never completed, nor published, it remains locked in Harvard’s archives for decades to come. Wardle deftly navigates this heart-breaking tale, maintaining a tension that has the viewer wide-eyed and incredulous throughout. He is aided by the copious, and entertaining, American TV footage of the triplets since their reunion. Nonetheless, the youthful, wide-smiling trio become ghosts by the end; as nature/nurture and attachment is contemplated, it is the triplets’ overwhelming loss of their early years’ bond, and the tragedy that arguably resulted, that resonates long after the end credits roll.